Whether in the business for many years or just now beginning to dabble in it, the vacation rental management industry is growing by leaps and bounds. No matter the size of your company, it is vital to stay on top of the latest technologies, trends and ways to effectively run your rental management business. Let’s face it – this industry is one that requires more attention to detail than most any other business – except maybe accounting or medicine. That is where conferences come in handy – where else can you listen to some of the best speakers in the industry, learn what others are doing to be more efficient and experience the latest and greatest technology to help make your business more successful? VRMA Annual Conference, San Diego, CA, October 26-29, 2014. 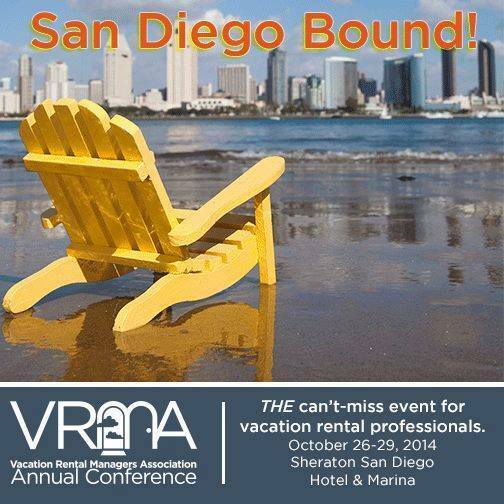 Coming up this weekend, the VRMA conference is probably the best conference to attend if you are interested in keeping up with the latest and greatest in vacation rental management. It is a four-day networking extravaganza of software demonstrations, lectures, discussions and anything else you may want to know about vacation rental management. The leaders in the industry gather together to let you in on the little secrets that have made them the successes they are. It takes place in one of the most beautiful places in the country – San Diego is spectacular. And, at the Sheraton Hotel and Marina on San Diego Bay, the backdrop and views make even more spectacular. Since is it is quickly approaching, advanced registration is closed but you can just show up and register when you get there. If you are in the vacation rental management industry, this is an event that you really should attend. PhoCusWright Conference, Los Angeles, CA, November 11-13, 2014. PhoCusWright’s conference takes a different approach to rental management by “phocusing” more on the travel industry. This is an opportunity to hear and learn from the industry’s leaders on the next big thing in the travel and vacation industry as well as participate in demonstrations with new products, services and pretty much anything else that streamlines your job. We have discussed the importance of becoming a vacation experience provider and the PhocusWright Conference is probably the best place to get new ideas to help further that cause. The venue is in the heart of LA at the JW Marriott in Downtown. We suggest that you plan on attending the entire three-day conference to give you a whole new focus on your business. Triple Play Realtor® Convention and Trade Expo, Atlantic City, NJ, December 11 – 15, 2014. The Triple Play Realtor® Convention and Trade Expo is yet another conference that is great for companies that service the rental management industry. More and more real estate brokerages are dipping their toes in the rental management pool to create a new revenue stream to their offices making this the perfect venue to showcase rental management software and other systems used in rental offices. And to spend a little time before the Christmas holidays in Atlantic City to cash in on some extra spending money for presents! Conferences and trade expos are ideal opportunities to learn new methods to increase, revitalize or streamline your business. If you are planning on attending or even thinking about attending any of these expos, be sure to think ahead and plan your strategy to get the most out the event. After attending these events, we come away with a lot of knowledge, contacts and more – we know you will do the same. Barefoot will be represented at all of these conferences, so please look for us and stop by to say hello.